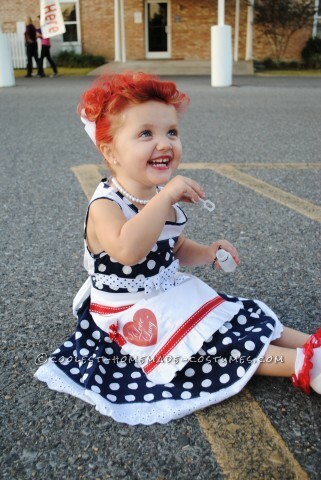 Adorable "I Love Lucy" Homemade Costume for a Toddler! Adorable “I Love Lucy” Homemade Costume for a Toddler! Well, I wanted to do something original for my 2 year old daughter for Halloween! She already has naturally curly hair so I started thinking of a character who had curly hair. I’ve always loved the TV show “I Love Lucy ” so I thought I would attempt to make a costume. I got to looking on Ebay for a polka dot dress and scored one for $10! Then I wanted her to have a little apron with the logo on it so I went to the local fabric store and purchased some cheap white cotton fabric, a yard of red ribbon and printable iron on fabric paper. I just started sewing so I ‘m at a beginner level but managed to make a pretty good looking apron! I used some iron on backing and lined the ribbon on the apron and ironed it on! Next I made a heart shape on the computer using Microsoft word and wrote the words “I Love Lucy ” with a cursive font. I printed the heart on the iron on fabric paper and transferred onto my apron! The first time I printed I forgot you have to make a mirror image of it or it would iron on backwards! I had already ironed it on wrong! Since I didn’t want to have to sew another apron I sewed a little pocket onto the existing apron over the backwards heart and then printed it again and sewed it onto the pocket! Topped the pocket off with a little bow and it was finished! For her hair since it ‘s already curly I just pulled it back with a white bow and rolled her front pieces under and secured with a bobby pin to make the front curl! I bought some red hair spray from Sally ‘s because I wanted her red color to be bright red so I bought the little more expensive spray! Her pearl necklace and bracelet were from Buy and Save and cost one buck! Once we were done it was off to trick or treat! We had many compliments and many of the older grandmothers out wanted to take photos of the “Toddler Lucy “! Homemade costume idea posted by Akayla V.
I want this for my child. It is adorable! I’ll buy your hand-me-downs? Is this dress still available on Etsy?! How did you dye her hair? Will you be willing to custom make one, please??! Omg!! This is Great.. My daughter is pregnant and hoping for a girl! If its a girl she is gonna name her lucy… This costume would be perfect!!! Love love love it! !